One of the biggest parts of a home today has to be it’s home entertainment system. From the latest and greatest TVs and sound bars to streaming services and smart devices, hi-tech entertainment is a vital part of our lives. It’s become engrained in the fabric of our lives. To that end, I think we will always seek out the best products and services for our money. It’s part of family time, it’s part of wind-down time, and it’s a way that we all can stay connecting to the world around us. With this blog, and with my life in general, I’m always very interested in learning about the latest and greatest in this world. As far as the best TVs, I would have to think that the 77’’ class LG OLED C8 TV is right at the top of anyone and everyone’s list. You can enjoy, perhaps, the most premium cinematic, home theater experience with the LG 77″ Class OLED C8 Series 2160p Smart 4K UHD TV. This bad boy allows you to truly immerse yourself into movies, tv shows, sports, and more for an unmatched experience in gorgeous Ultra HD 4K. The quality of the ultra immersive experience is unreal. Period. Conveniently control your TV with voice commands to change picture settings (movie mode, game mode, sports mode etc. ), change volume of tv, search for shows and movies, control compatible connect home devices. Control of TV and connected devices with the power of your voice and without disrupting your movie watching experience. This smart TV also allows you to launch apps like Netflix, Hulu, and more! In addition to the amazing functionality of the AI ThinQ®, let’s not forget about the importance of the picture. It’s such an important part of the experience, right? Many would say it’s the most important thing. 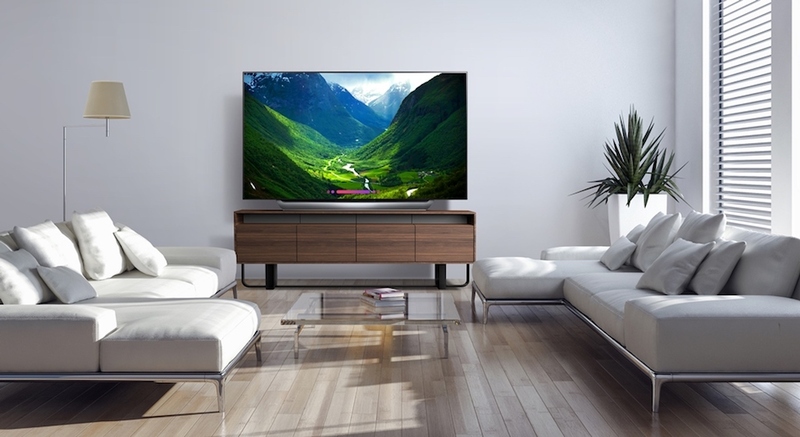 I can tell you, the LG 77″ Class OLED C8 Series 2160p Smart 4K UHD TV is about as fantastic a picture as you can imagine. It’s probably beyond your imagination! TVs today are pretty much computers, so the processor is just as important as it is in computers. The Alpha9 is LGs most powerful processor and is an award winning intelligent processor. It provides superb picture quality and true-to-life images with incredibly rich colors, sharpness and depth to deliver the ultimate picture quality. Bottom line: the amazing picture quality seems lifelike and real like no TV I’ve ever seen. Dolby Atmos* transports you with moving audio. Dolby Atmos content creates a more detailed sound experience that appears to come from everywhere for a wonderfully realistic. This completely immersive experience puts you inside the story like nothing else. If you are looking to up your game and take the leap into this awesome cinematic experience, the time is right! 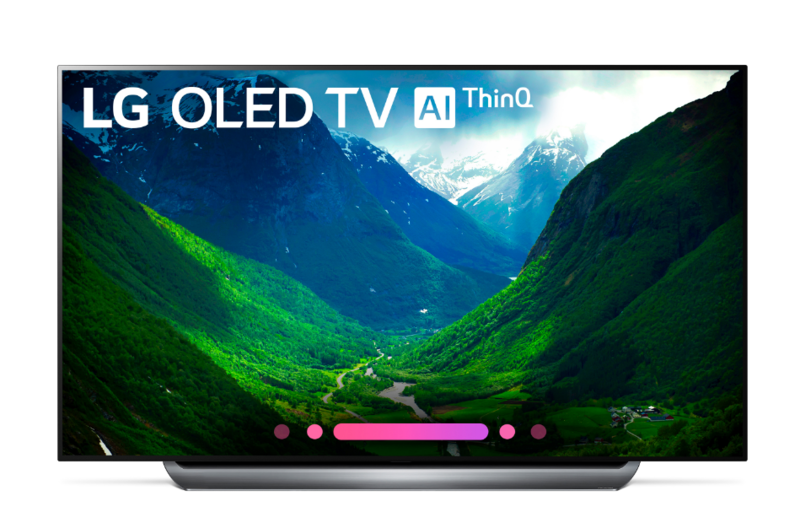 Right now at Best Buy, you can save up to $1000 on select LG OLED 4K TVs!!! That’s an incredible savings on something that is pretty much a requirement for living your best life. Ok, maybe that’s a little much, but man it’s an amazing TV at a fantastic price, right? *Dolby, Dolby Atmos and the double-D symbol are registered trademarks of Dolby Laboratories. (User Benefit: Cinematic sound and hear sound from overhead and around for a cinematic experience). Now that’s what I’m talking about! We want a 4K, and LG is a great company. Of course, their proprietary tech and that HUGE screen make the choice easy. ooooohhh i wish i came across this post sooner! we literally just bought a tv but it’s not nearly as nice as this one hahaha maybe next time! Our current television is LG and I don’t think we’d ever go back to another brand. High quality at affordable prices is one of the things I love most about LG. And, since it’s Alexa compatible, I’d have no issues selling my husband on an upgrade! That bad boy is NICE! We currently have a 55″ in our living room, but my husband has been wanting to upgrade. I’ll have to share this post with him. That is one impressive television! 77 inches of quality and 4K ability is a awesome. Sounds like an awesome television! It’s incredible to me how much technology has advanced within just a few years! Very cool! OMG. That is one awesome TV! If I had that, I’d be watching movies all day everyday! It just amazes me that something as big (and slim) as that could provide such clarity! Wow. 77 inches is massive! This would be amazing to have I would have all of the movie nights! This is awesome! I like the energy saving benefits of these. Totally worth the upgrade!